The major thing to check out is the new flight controls and skydiving system. Q and E on a keyboard now tuck the wings. It feels better when using a controller, when the triggers are mapped to wing tucking, which makes you turn more sharply. Wander, the non-combat MMO releasing June 4th. Launch Trailer. We're very excited to announce that Wander will be coming to PS4 and Steam on June 4th. You can see the launch trailer below. 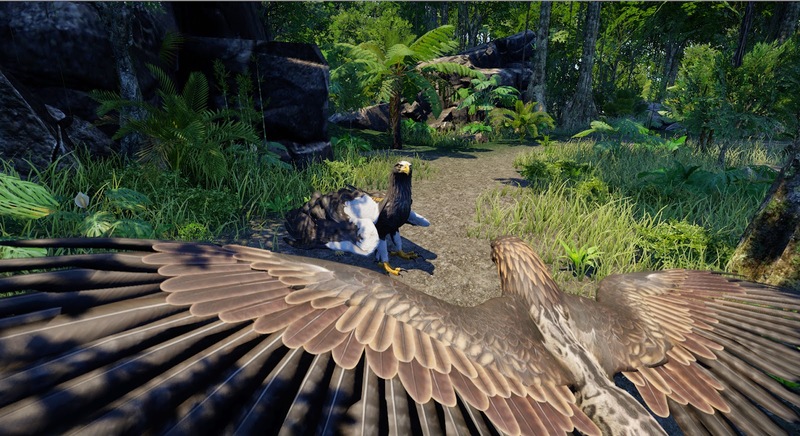 We will be telling a lot about the new features in the next few days but now check out the last post by Crystal and our post on the PlayStation Blog. Greetings! Crystal here to bring you some more juicy Wander goss. Things are getting pretty exciting (that’s a nice way of saying “hectic”) around here as our release date is fast approaching. The hira I showed you in my last post has finally come to life; in fact, I’m watching her running around on the beach at this very moment, and she looks absolutely fantastic. Believe me, though, she can do a lot more than just run: she can also skydive! I know I talked about it quite a bit last time, but skydiving is now officially a thing! 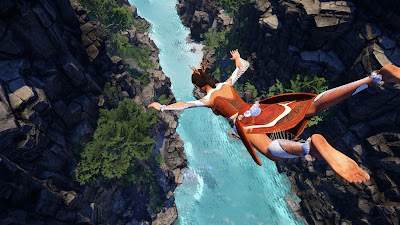 It’s super fun and looks really awesome, and really, what could be better than consequence-free leaping from dizzying heights? Don’t even lie, I know you’ve thought about it. We all have. So, now you can fly, swim, skydive, and… be really tall and leafy? With so many great characters I imagine it’d be hard to choose a favorite, so I guess it’s a good thing you can play as all of them and don’t have to! Speaking of cool things you can do, one of the cool things players will be able to do is communicate with each other, even if they don’t speak the same language in the “real world”, since here at Wander we scoff at silly things like “language barriers”! This feat was accomplished by the invention of Wander’s very own language: Rozhda, a process that involved a monumental amount of trial and error (and blood, sweat, tears, and frustration. I’m pretty sure I’ll flinch every time I see the word “waterfall” for the rest of my life!). 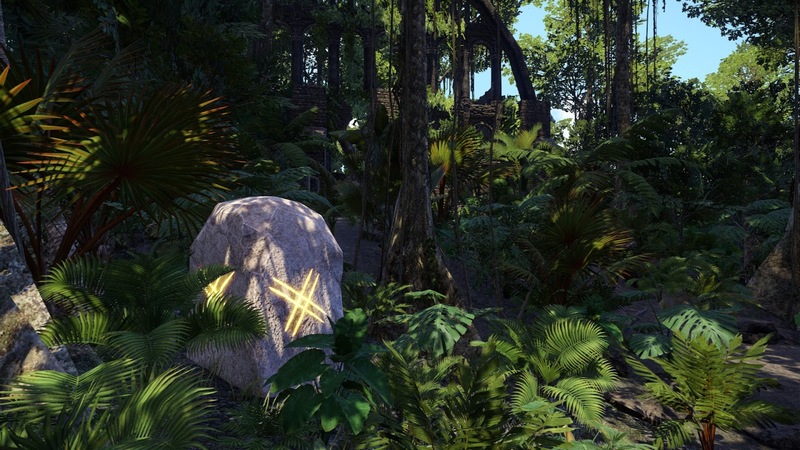 While exploring, players can discover glyphs (similar to runes), each of which correspond to a word. Find enough words - or learn how to combine them creatively - and you can chat with other wanderers and share your experiences and discoveries with them. Or just brag about a really cool tree you saw one time. Anyway, moving on! The architecture in this game is starting to look fresh to death, so it won’t just be serene oceans and tranquil forests you’ll get to traipse around in. There are even buildings at the bottom of the ocean! How’d they get there? I’LL NEVER TELL. But savvy players just might be able to find out for themselves. Lastly, maybe some of you are just as obsessed with music and sounds as certain members of the Wander team are (not that I’m referring to anyone in particular, of course). If you are, you might be interested in a little thing we now have available called the Wander Soundtrack, composed by the amazing Benjamin Woodgates. If you want to jazz up your boring walk to the train station by pretending you’re strolling through a tropical rainforest, have we got the solution for you! Get it from Bandcamp. I’ll be keeping you updated in the lead up to launch! The door is about to open, we have only to step through to the other side (cue “The Final Countdown” here). Of course, the journey will continue, it’ll just be after the game is released so you’ll all actually be able to see for yourselves what I’ve been going on about this whole time. I sincerely hope it lives up to your expectations! We’ve got big plans for what we’re adding after launch as well. Aaaanyway, as per usual we’ve been busy little bees lately, with lots of cool new features. Specifically, we’ve got lots of new griffin/flying-related stuff to talk about. For those of you who’ve ever gazed into the infinite depths of the sky and thought: “Man, I’d sure like to fall like, a really long way down, and maybe land on a friendly griffin while I’m at it”... well, soon you can! You’ll be able to skydive! I don’t know about you all, but I think that’s freaking rad, and a really good incentive for you to make friends with some griffins. “But, Crystal,” you say. 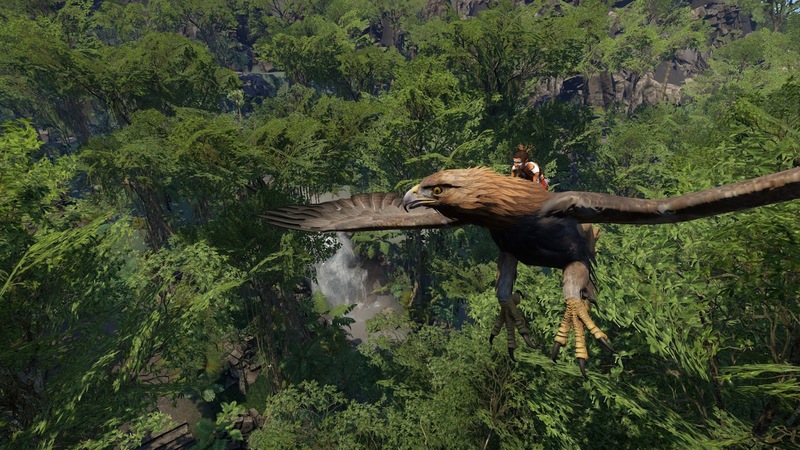 “I just want to take a regular, non-death-defying ride on a griffin!” Well, to this I reply: why do you hate joy? And also, you can totally do that! If you’re a hira, and you have a griffin pal who is willing, you can ask them if you can “hop on” for a jaunty ride! This is an awesome way to get places faster, especially if one of you really wants to show the other one something amazing. Just don’t be too offended if your offer is refused. Maybe the griffin just thinks you’re not ready to move to that stage in your relationship yet, so just chill, bro. Ahem! So yeah, they’re pretty cool. First up is a bit of a teaser: the long-awaited hira! I know you guys are probably sick to death of hearing this word “hira” constantly and thinking: “Well what the heck even IS a hira?” The answer… is THIS! This is yet another example of some wonderful collaboration from our team. To say I was impressed by the result is a severe understatement. I wish I knew how to do my hair like that! The same could be said (about me being impressed, not the hair), for the stunning piece of work I’m about to reveal to you next. Hold onto your butts as you feast your eyes upon the all-new and vastly improved azertash! Those of you who can recall the original azertash may remember that it bore an uncomfortable resemblance to Fluke-Man from the X-Files (at least I thought so), so I am tickled pink to see this adorable, colourful and intelligent-looking creature who is clearly bursting with personality. In this form, you’ll be able to swim the depths of the ocean and discover all the mysteries contained within. If you were impressed with the hira pictures, it gets even better, believe it or not. You can see the azertash in action below in our all-new trailer! It is, in my opinion, much better than our old all-new trailer, and I thought that one was pretty good. 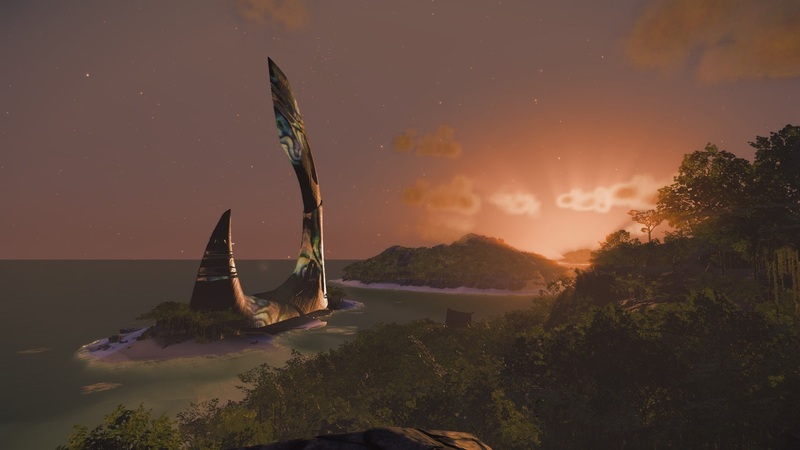 In addition to many of the new characters, you can see loads of the incredible areas you’ll be able to explore, and they are AH-mazing. My feeble words cannot do it justice, so just watch it! Last but not least, we are going to PAX East and GDC! If you’re keen to try the game in person come see us in Boston at booth #11068. We will be trying not to freeze and also showing off all the new features. So, that’s all for now! Very exciting stuff, and it’s only going to get more exciting as our release date quickly approaches. Don’t worry, we’re not panicking… much! Well, everyone, a new year has dawned, and if movies are anything to be believed then hoverboards are on their way to us as we speak. Failing that, I guess we’ll just have to make due with the tiny computers that we all carry around in our pockets. Hopefully everyone had a bitchin’ (religious or non-religious holiday of your choice), and a totally radical New Year. Personally, I frittered away the majority of my holidays playing Dragon Age: Inquisition. It was a pretty amazing year for us, we were invited to the very first Playstation Experience ever, in Las Vegas (strange city, great event), we attended Gamescom in Germany, and Pax Prime in America. We also won some awards! Thanks to everyone who came, played the game and chatted with us. It was fantastic getting feedback and ideas from all of you. Another cool thing is that we had a number of articles written about us, at least one of which quoted me specifically (using my full name as well… weird, but anyway). In other news, we’ve been working on lots more great stuff for the game, including a very cool idea for managing the map, any lore that you’ve found, and changing into other forms. I’ll give you one big hint: this cool idea doesn’t involve a menu at all, so there will be no interruptions to your experience exploring the world. Okay, I’ll give you ONE more hint: it’s going to look freaking awesome too, so prepare your eyeballs accordingly. As far as my favorite topic is concerned (art and architecture, of course), there’s quite a bit going on. Our Azertash cities are really coming together; in addition to fantastical shapes we now have fantastical textures as well. For example: imagine a massive tower made of mother-of-pearl jutting majestically out of the ocean. Now, wouldn’t that just look resplendent shining in the sun? Honestly, we’re really just planning on going all out with these underwater cities and incorporating as many cool materials and design elements as we can. 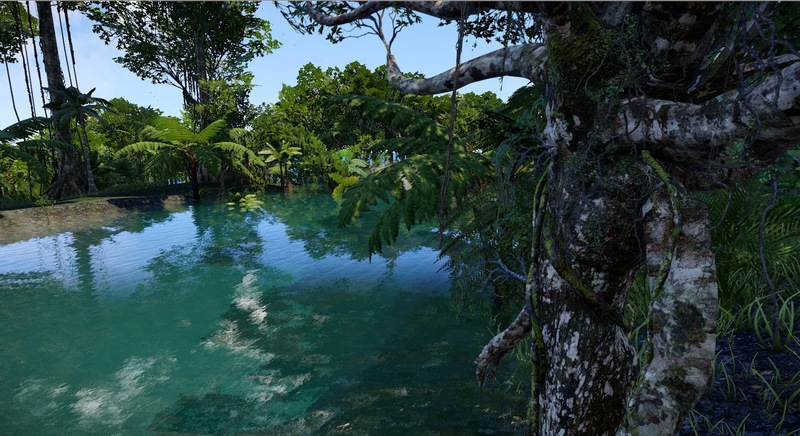 Some of our artists have been working hard on the underwater environments, including coral reefs, so you can expect to see some of that incorporated into the underwater cities in some manner or another (but how, you ask? WAIT AND SEE). Speaking of Azertashes, the final design for those rad dudes is coming ever closer to fruition. Every time I see a new incarnation I’m exponentially more impressed, so I’m expecting the final version to blow the top right off my head. Yours, too, if you like beautiful looking fantastical creatures. So, as you may or may not be aware, release date is coming up fast! I’m having a panic attack just thinking about it! However, release is only the start of the live play period of Wander. We are eagerly looking forward to continuing to add heaps of content and new features. Believe me, we’ve got ideas coming out of our ears, so there’ll be new updates on the regular for you guys to sink your teeth into. How far can this go, you may ask? To this I answer: the possibilities are limitless! In Season 1 we're going to be following Sylvania, a young Oren, as she explores her dream of flying and realises that what she is, isn't all she can be. The series features a talented cast of actors and Qiao Li as the Director Of Photography. Live machinima hasn't been tried much before (or even at all on Twitch that we know about!) so we're pretty excited to be breaking some new ground. As well as getting much deeper into the narrative of Wander, we're also going to be showing off a lot of new content and features. We're also excited (we are a lot at the moment!) to announce that we will be in Las Vegas next month for PlayStation Experience. Come check out Wander there! Weather, new cultures, new Azertash city concepts! Good evening, cats and kittens (and griffins)! Crystal here comin’ at ya with the latest from the Wander headquarters. First off, I’d like to give a shout-out to the two newest members of the team: Tejay and Criss. Tejay is from the illustrious capital of our nation, Canberra and is doing modelling and texturing. Criss is based in Boston, USA and is helping with PR. Also, the addition of Criss means that I am no longer the only North American on the team. *Cries* I’m slightly less special and interesting!!! Next, our level and character designs are still progressing as awesomely as ever. We’ve got several new types of griffins, and I must say they look amazing. This has been an idea a long time in the making and I’m super excited to see these designs finally coming together. We’ve also got some new mossy texture for our Oren, and as we all know it’s the little touches like these that really make a world feel alive. In addition, our azertash design is coming along nicely. 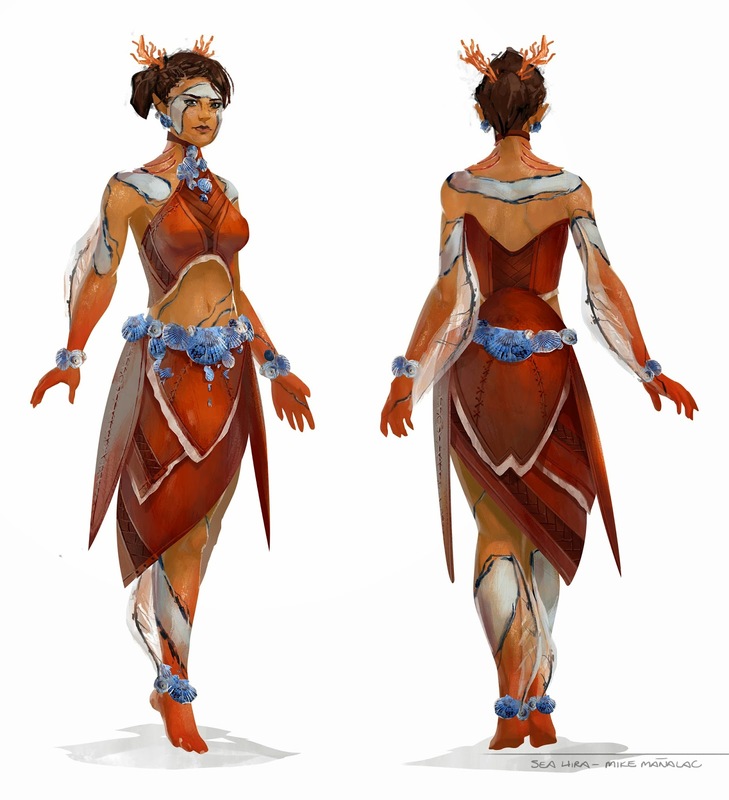 This is a character design with a ton of potential to look completely stunning, and we can’t wait until the finished product is ready to reveal to you all! 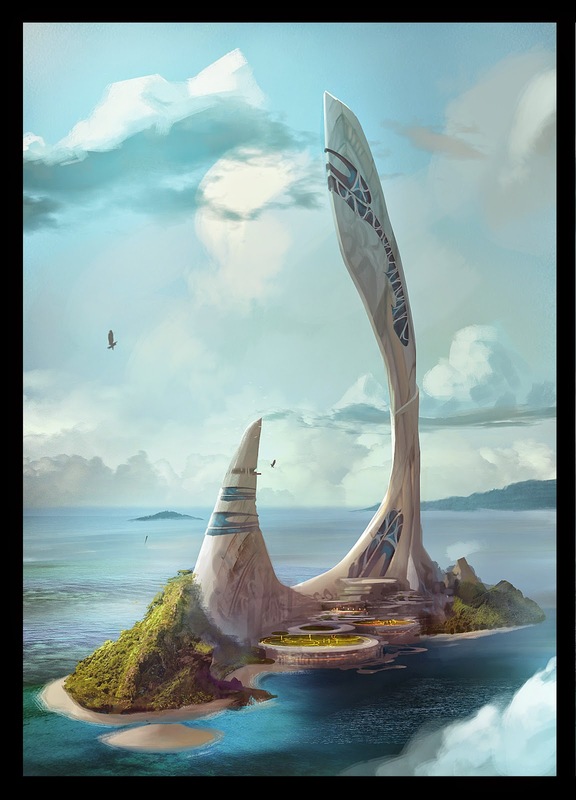 Speaking of azertashes, we’ve got some magnificent new concept art for some of our planned Azertash cities. These are looking pretty fantastic, and I just can’t wait until you guys can dive right in (pun intended) and start exploring these babies. Another super cool feature we’re working on is - and stay with me now, folks - the weather. We're working on real-time weather systems for Wander which will have rain, clouds, storms, but most importantly, wind. Wind will be used for soaring flight, including the two major mechanics of soaring flight: thermals and ridge lift. Weather is modeled to have seasons, day/night cycles and cold fronts/storm systems, all of which combine to make flying different from day to day. To fly from point A to point B players will need to learn how to best use current weather conditions. 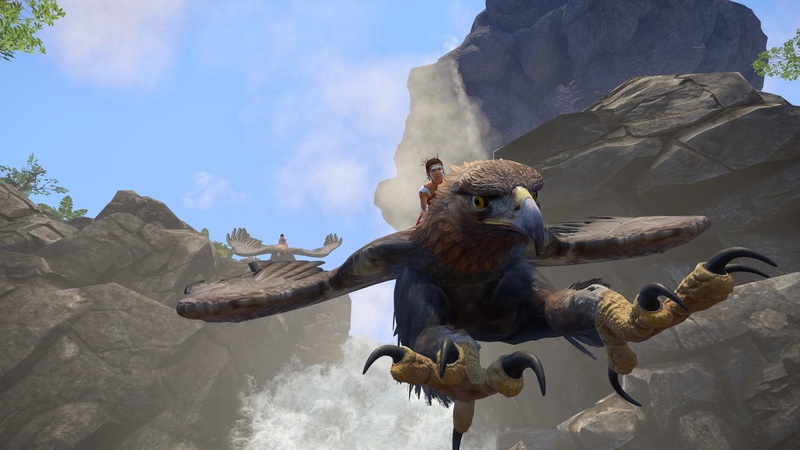 This will add a totally new and challenging element to playing as a griffin, and those who assumed that flying would automatically be the quickest and easiest way of getting around may be in for a shock! We’ve got some other exciting things in the pipeline; one of these things is so exciting that I can’t actually tell you what it is! All I’ll say is that it involves me, personally, working harder than ever before in a format I’m not familiar with (“I just assumed you could do everything!” - Actual quote from Loki), and some professional actors hanging around the offices. Was that vague enough? I promise you’ll be delightfully entertained once the big secret is revealed! Anyway, that’s all from me! Time to get back to doing (SUPER SECRET PROJECT). Until next time!